Lauderdale equals East Coast Bombers. Visitors equals Dodges Ferry Sharks. It’s poor form that a ground hosting a final between two visiting teams couldn’t go to the trouble of putting their names up. This is Lauderdale Oval, home of the Tasmanian State League team Lauderdale Bombers. 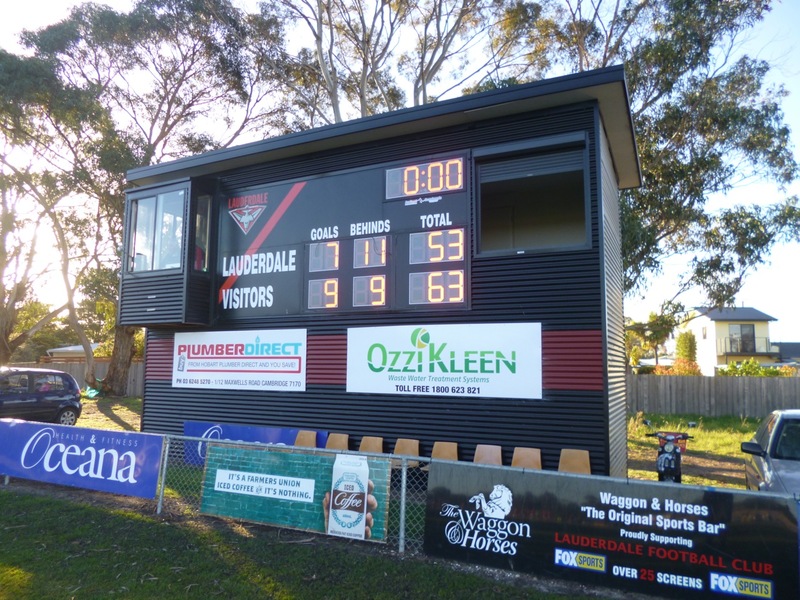 On Saturday 23 August it hosted a 2nd tier Southern Football League elimination final between the East Coast Bombers (who the scoreboard called Lauderdale) and the Dodges Ferry Sharks (Visitors). When the sides met only six weeks ago the Bombers had prevailed by nine goals. This was East Coast’s first ever final, and the more experienced Sharks were too good under pressure in a tight final quarter. Final score. Victory to the Visitors, the un-named Sharks. Lauderdale as a community (pop. 2500) are punching above their weight in the TSL, playing against teams representing metropolitan Hobart, Launceston, Burnie and Devonport as well as traditional powerhouses North Launceston, Glenorchy and Clarence. They sit 3rd on the ladder and would have a chance of a home final, but their facilities have been pronounced not up to scratch to host a prestigious TSL final. 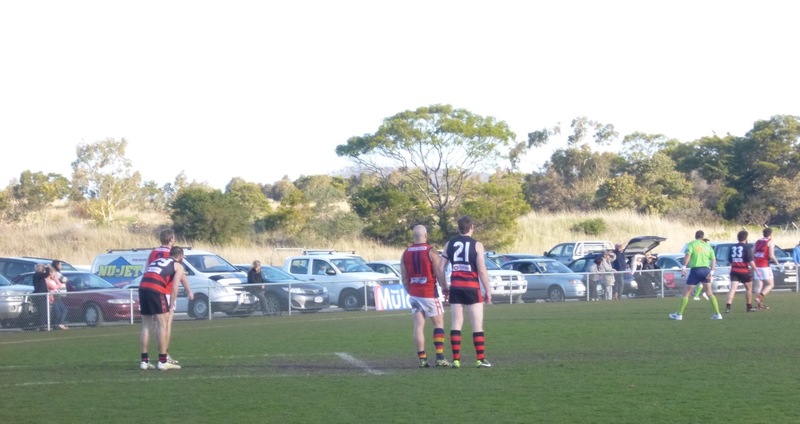 So while local Bombers were playing away at Devonport, the ground played host to the SFL instead. 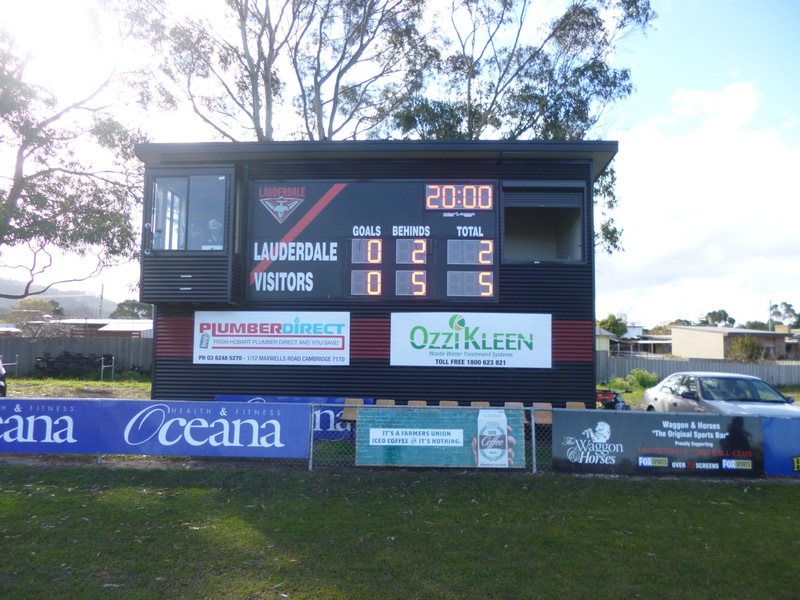 The scoreboard probably dates from 2009, when Lauderdale were included in the newly constituted TSL. While lacking in character and flexibility, it did feature a couple of classic old timekeepers, one in a fedora. The can bar on the northern wing offered free bar snacks. The ground is built on a flat and narrow neck of land between Ralphs Bay and Frederick Henry Bay. The surrounds are very flat and swampy, and on occasions the carpark around the ground goes back to nature. It’s probably an excellent spot for bird watching. I hope the Lauderdale Bombers can develop their ground to be an acceptable finals venue, without affecting its lovely character.